Green Bay Packers Bulletins were printed beginning in the 1928 season and ending in the 1932 season. Bulletins were printed as a newsletter-type "promotion" of the Packers next home football game, with this game usually the next week. Bulletins measure approx. 7" x 10 1/2", and are printed, front and back, on a single sheet of colored normal weight paper. The first Bulletin had a print date of October 28, 1928, and contained information on the Packers upcoming gridiron contest against the Pottsville Maroons on November 4, 1928. No kale, jack, dough, scratch, mazuma, voot, simoleans, clams, cabbage, shekels, lucre, gelt, lolly or rubes needed to be exchanged for a Green Bay Packers Bulletin, as they were distributed free of charge. We wish this fact remained true today. The example below, dated October 18, 1931, was promoting and advertising the October 25, 1931 home professional football game against the Providence SteamRollers at City Stadium, Green Bay, Wisconsin. This Bulletin was published by the Green Bay Football Corporation, and printed by Landsmann Printing Office. The back of the Bulletin states 'Plenty of Good Seats for Everybody'. 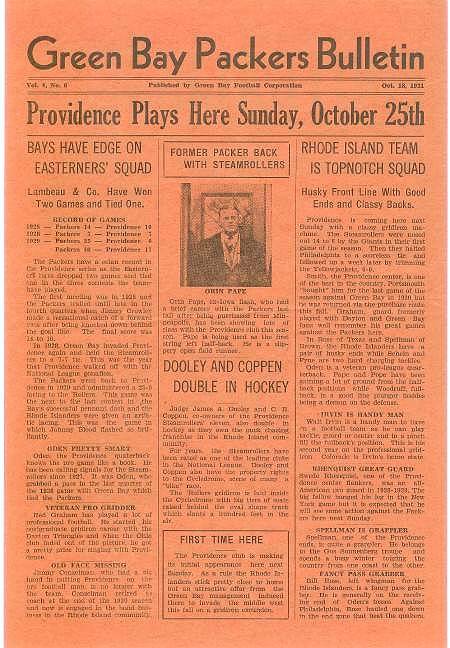 The Bulletin also states that the Providence game was a Packers Homecoming Game, and it was expected that two dozen "old timers" would take their bow to the crowd between halves. Imagine, in 1931, the Packers 11'th year, they already had former and current players considered "old timers". Packer Bulletins are somewhat rare, and command good prices when they become available. Expect to pay $ 225.00 to $ 325.00 RETAIL for most Bulletins in excellent condition. Bulletins with a picture of a famous player, such as Red Grange or Ernie Nevers,will command premium prices. 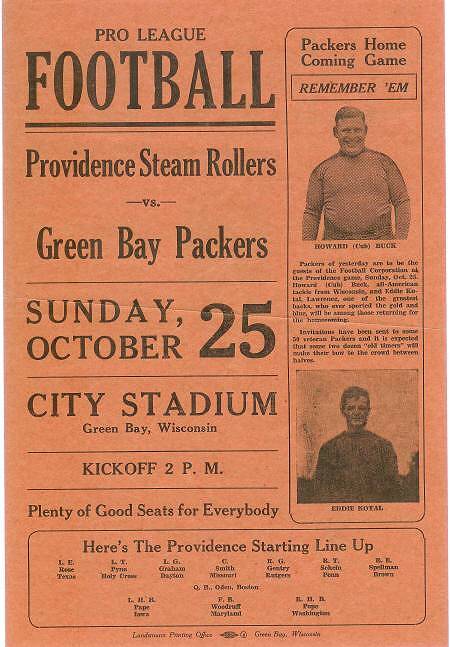 It is widely felt that Bulletins may have been distributed in many ways, such as at Packer home games, hotels, retail businesses, businesses that sold Packer tickets, to the press, pool rooms and like places of amusement. They most likely were posted anywhere potential 'paying game fans' or other interested parties would congregate.